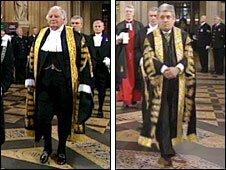 Commons Speaker John Bercow has ditched the stockings worn by his predecessors for the State Opening of Parliament. Mr Bercow instead wore an outfit he has described as a "fusion of tradition and modernity", which includes trousers and an ordinary neck tie. He was taking part in his first state opening since replacing Michael Martin, who quit as Speaker in June over his handling of the MPs' expenses scandal. Mr Bercow said his change of attire was not meant to be "disrespectful". His predecessors, including Mr Martin, who recently became Lord Martin of Springburn, have opted for a white ruff - a form of frilly neckwear - and stockings for Parliament's biggest annual occasion. Mr Bercow, formerly a Conservative MP, revealed his revised outfit during the procession from his office to the Commons chamber. He continued to wear the traditional black and gold robe of state, over a morning suit. Ahead of the event, the Speaker told the BBC he was "anxious", adding that he wanted to "put my best foot forward" for the ceremony. The Queen was less likely to feel butterflies, as it was her 58th state opening. Mr Bercow said: "I do intend to wear a black and gold gown because I think the state robe is important and I think it says something significant about the relationship between Parliament and the monarch, and the role of the Speaker on such an occasion. "But I am intending to wear a morning coat and to have the state gown on top and I shall very probably wear a House of Commons tie." Asked about the lack of stockings, he said: "It's certainly not disrespectful. There's inevitably going to be criticism. "But, equally, people will say that it is a good thing that we should respect the past but not live in the past. "When you talk about dispensing with court dress, a morning coat is a modern form of court dress. So I am preserving some element of tradition, which I think is valid and justified, but updating the attire somewhat as well. "And I think, therefore, there is a fusion of tradition and modernity." What did you think of Queen's speech?